Google Maps Australia offers street maps, route planners (by car, foot, public transport) and customisable visuals. 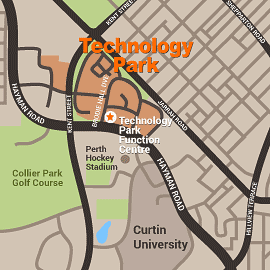 It can also help with finding businesses and organisations located on Technology Park Bentley. If you require detailed instruction on how to get to the Function Centre, or have any other queries, please call our helpful staff on 08 9451 0888.